Presents wrapped? Turkey basted? Getting ready for Christmas is exhausting for most of us. But imagine planning your Christmas Day party for a guest list of 2,000. Now suppose that every one of those guests is a child or young person who does not expect to receive presents and has nowhere else to go on Christmas Day. That is the challenge faced by Camila Batmanghelidjh and her staff at Kids Company. The London-based charity, which supports vulnerable inner-city children, will provide Christmas lunch, games, entertainment and gifts for everyone who comes to the event held in a south London school. Some 160 volunteers including jugglers, face painters and magicians, are giving up a few hours of their day to keep the children entertained. 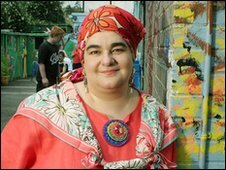 "Around Christmas our children really panic," says Ms Batmanghelidjh, founder of Kids Company. "It throws up the discrepancy between an idealised family life portrayed in media and the challenging circumstances our children are in," she says. "We decided to give them something to look forward to." When Ms Batmanghelidjh awakes on Christmas Day morning, she has a long, rather unusual, day ahead. She will spend most of her time in a decorated garden shed that she describes as "her little grotto," while children queue outside. The children, who begin to arrive early in the morning, enter the shed one at a time to chat with her. Her chats "are sometimes very painful," she says. "They might say 'Mum couldn't be bothered to buy me a pair of socks' or they might try to protect their parent." Each child then receives a sack of presents, selected from thousands donated by people and businesses from across the UK. These include a main gift - which could be anything from a toy to a laptop, plus an item of clothing and some toiletries. With entertainment ranging from bouncy castles and live DJs, to a room offering holistic therapies, manicures and massages, the Christmas party involves far more than most household parties could offer. And the food ranges from traditional to more alternative fare. "One year we had chicken jerky, which was really popular," says 18-year-old volunteer Genta Haxhija. 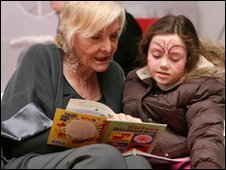 Katie was one of the children at the first Kids Company Christmas bash. "For the first party, Camila did all the shopping herself and about 50 people came down," she says. This year, she says she is looking forward to seeing friends she has made through Kids Company. "The whole day will be amazing," she says. "When you think how many children are there on that day, your heart lifts from its socket," says Ms Batmanghelidjh. But her favourite part of the day is the end of it. "If it's ended peacefully, I feel a massive sense of relief," she says. "It's a huge responsibility having that many [vulnerable] children in one place." It is usually late in the evening when she comes out of her grotto. "Then I usually burst into tears," she says. "It's quite overwhelming." When the party is over, food hampers are handed out to some of the children in the hope that nobody will go hungry in the following days. Then there is the massive clear-up operation. "On Boxing Day, a team of about 30 volunteers spend the whole day cleaning up," says Ms Batmanghelidjh. "Then on the 27th, you can't get me out of bed," she adds. But the charity's emergency team is on standby, for any children who feel abandoned. 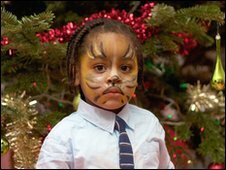 In fact Kids Company provides what many see to be a surrogate home for inner-city children every day of the year. "We assure the kids have access to someone who will help 24 hours-a-day, 365 days of the year," Ms Batmanghelidjh says. She says she looks for "people with grit" to help out at Kids Company over Christmas. "I look for people with a belief in child-like delights and the grit to understand the upset that's likely to come too," she adds. "It is a time when our children are emotionally charged." What turns children to violence?